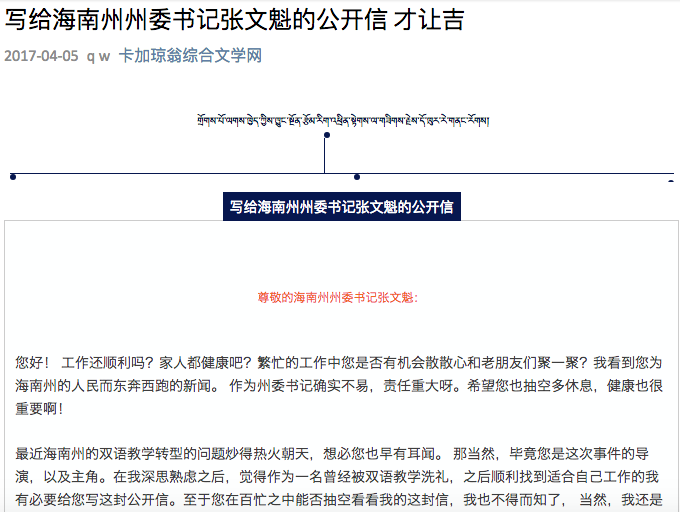 Even though the piece on bilingual education in Tsolho Prefecture, Qinghai Province, started to be shared and commented on a lot, very few digital traces remain today, just a few days later, as it was censored very quickly. On this link where it was taken down after one day, it had already generated over 400 comments, these have also all been taken offline. Discussion and debate about the Chinese/Tibetan bilingual education policy kept on going, at one point a collection of over 30 open letters were posted to WeChat but these have also been deleted. Even prominent Tibetans such as Dorshi Rinpoche wrote about his own views but his post has also since been taken down. The censorship of all these voices has been swift and thorough. Unfortunately it is unclear who the author Tsering Kyi is and what their background is, apart from what’s in the piece. Thank you to Timothy Thurston and Séagh Kehoe for their help in putting this post together. How are you? Is your work going well? Is your family in good health? Do you find time in your busy schedule to meet friends and relax every now and then? I saw the news about the efforts you are making for the people of Tsolho Prefecture. Being a Party Secretary is really not easy, you have a great deal of responsibility. I truly hope you also find some time to relax; remember, a healthy body is also important! Recently, discussions about the transformation of Tsolho’s bilingual education system have been in full swing. I am sure this has also come to your notice. But of course it has because you assume the role of the director and also of the main character in these recent events. After some careful reflections on my side, as someone who enjoyed bilingual education and subsequently found a decent job, I decided that it is necessary to write you this open letter. I am not sure if you find time in your busy schedule to look at it, but I certainly hope that you do. Before I decided to write this letter, I didn’t know who the Tsolho Prefecture Party Secretary was and I didn’t know who Zhang Wenkui was. From some scattered information online, I gathered that Zhang Wenkui is the Party Secretary and the main leader behind the transformation of Tsolho’s bilingual education system. Based on your name, Zhang Wenkui, I used to think that you were Han Chinese, which is why I could understand why you would want to reform the bilingual education system; many Chinese officials don’t fully understand what bilingual education means to ethnic minorities, especially to Tibetans. Later on, I found your CV on Baidu and was shocked to find out that you are, in fact, a Tibetan official. At first, I wondered if maybe the websites mixed up your ethnicity, but when I saw photos of you wearing Tibetan clothes, I started to believe it. Originally, I wanted to write you this letter in Tibetan; I would have been able to express myself more clearly; but then I thought that you probably don’t read Tibetan, so I opted for Chinese in the end. I know you have a secretary who could translate for you, but I also didn’t want to bother your secretary. In the following, I will use my own and some examples from my circles to expound on the meaning of bilingual education, as I understand it. When I was young, my parents decided that me and my little brother should receive bilingual education, they never ever doubted their decision. From primary school all the way to university, we were both products of bilingual education. We passed the entrance exams for Qinghai Normal University and Northwest University for Nationalities, respectively. And both of us found jobs that we liked after graduation. This by no means shows that we were particularly outstanding, it simply was a positive effect of the bilingual education that we had received. Two of my relatives whose view on education was exactly the opposite from ours thought that bilingual education would not form excellent students, so they sent their children to ordinary schools. When it came to the university entrance exam, one out of the four kids managed to enter a third-grade college somewhere in China, two of them went to technical colleges and the fourth one didn’t pass the exam at all; later he tried again twice and then also entered some technical college. All of them have graduated now. Two of them found jobs that at least pay the bills. The other two change jobs more or less every three months and still rely on their parents for emergency financial support. When it comes to communicating with their families, it is really upsetting to see that they can only say very little in Tibetan (they basically don’t know Tibetan) and it sounds like their tongues are breaking when they speak, very unpleasant. Of course, they mainly speak to their families in Mandarin. I am sure you know what I am trying to say. And they of course don’t understand much Tibetan either, so in front of me and my brother, they feel inferior and lack confidence, which is why they asked me to teach them some Tibetan. I tried to do so for some time, but because we have all been busy with work, it turned out to be very difficult to continue our lessons. All I could do was encourage them to study hard themselves. You perhaps think that my family’s situation is just one example, that things aren’t really like that; but there are other examples of children in my circles who, as in my family, feel embarrassed and ashamed. My relatives often say to my parents that their biggest and lifelong regret is not sending their children to a bilingual school. Actually, I have a question which I am not sure I should ask or not. Do you, Mr. Party Secretary, speak Tibetan or have you ever studied Tibetan or even enjoyed bilingual education and training? Forgive me for asking these bold questions, but do you have children who have gone to bilingual school? And, just to be clear, I am referring to schools that teach in Chinese and Tibetan, because if I am not mistaken, in China, classes taught in English and Chinese are also referred to as “bilingual education”. I am not talking about these kinds of schools. I speculate that none of your children have enjoyed Chinese-Tibetan education or, if they have, it must have been a traumatic experience. Because otherwise, you would not be implementing this outrageous transformation of our bilingual education system in the entire Prefecture. In your research about Gepa Sumdo County, you emphasise that “Tsolho people’s education is very good, they are one of the leading Tibetan areas nationwide, but we must also have the courage to face the problem of today’s education not suiting the new developments in economic development and entrepreneurship, so, in the spirit of our responsibility to guarantee the development of the local people, we must push for a comprehensive transformation of the current bilingual education system and promote a reform of ethnic education”. You clearly know that Tsolho education is number one out of all Tibetan areas, but you still want to implement a transformation of our bilingual education in the name and under the umbrella of economic development, do you think that is suitable? Do you believe that many years of bilingual education have impeded economic development in Tibetan areas? Do you have sufficient research that can prove your assumption? And did you also suggest this to the national Bureau of Education, so that they transform bilingual education in ordinary schools and replace Chinese teaching with English? English is, after all, the international lingua franca and the official language of many economically advanced countries. According to your logic then, this would be very reasonable. You may want to seriously think about this. It is absolutely in line with your current conduct. But what if your education reform fails, who will take responsibility? Are you using Tsolho’s children as guinea pigs for your experiment? Have you actually considered all possible risks in your current plans? You probably haven’t received any bilingual education and you probably lack training in Tibetan literacy, which is why you don’t understand what this transformation of bilingual education means to Tibetans. It means that they will have to abandon their own language and writing; Tibetan words and script are our lifeblood, they are our foundation. 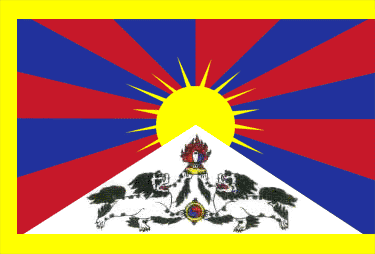 You might think that this is just a narrow-minded “ethnic point of view”, but for us Tibetans, it is a genuine system of values; in fact, it is the same for other ethnic groups that I know, including the Han. I have asked some Chinese friends around me if they were willing to abandon Mandarin and study English instead, most of them replied directly saying “of course not”. When I probed further, they gave some very simple explanations, they thought that Mandarin was their mother tongue and that it was also their culture, they use it to acquire knowledge; English is their second language, how can you expect people to use it as well as their mother tongue? In fact, the same simple logic can be applied to Tibetans, so perhaps you are making this more complicated than it actually is. By now, you should more or less know what I am trying to say, so I will no longer nag you. I recommend you to read some books and articles about the importance of bilingual education, because I believe that this would greatly benefit your plans of transforming the education system. Also, please don’t read articles by people like Ma Rong who is really just a fake scholar whose work doesn’t have much value. Oh and I almost forgot, make sure that this reform will not result in too much pressure on those working in education, they are having a really hard time.